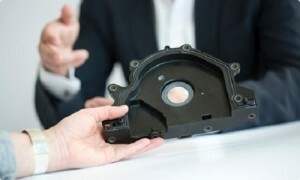 A lightweight, multi-functional crankshaft cover made of Royal DSM’s EcoPaXX bio-based polyamide (PA) 410 has won an award in the Powertrain category at the Society of Plastics Engineers(SPE) Automotive Division Innovations Awards Competition and Gala. The EcoPaXX crankshaft cover is produced by DSM’s automotive component partner KACO in Germany for the latest generation of MDB-4 TDI diesel engines developed by the Volkswagen (VW) Group. The engines are fitted to various car models made by VW, Audi, Seat and Škoda. According to DSM, the eco-friendly crankshaft cover weighs around 40% less than a crankshaft cover with similar geometry made in aluminum. Moreover, the total system cost is reduced by 25% for a similar die-cast aluminum crankshaft cover design. KACO produces the crankshaft covers in an integrated and automated process that involves insert molding a 50% glass fiber reinforced grades of EcoPaXX polyamide 410 over a plasma-activated dynamic polytetrafluoroethylene (PTFE) seal, and then co-molding this with a liquid silicone rubber static seal. The plasma process, which replaces a wet activation process involving solvents, is developed and patented by KACO. EcoPaXX is derived 70% from renewable resources, and is certified 100% carbon neutral from cradle to gate. This is the first time this bio-based PA is used in a powertrain component. DSM said the material has low water absorption for dimensional stability, with operating temperatures ranging from -40°C to +150°C. It is resistance to engine oils and diesel fuel and more importantly, able to bond not only to the LSR and PTFE seals, but also to the cast iron engine block and to a second silicone seal on the oil sump. “The partners in this project have taken a holistic approach to sustainability,” said Andreas Genesius, Head of Project Management at KACO. “In the application itself, the dynamic PTFE seals reduce friction to a minimum; the manufacturing process is completely waste-free; and the part makes substantial use of sustainable materials.